The NFL regular season is rapidly approaching. Soon, talks of the top players and best teams will flood social media as each team’s fanbase will champion for their guys. One of those key components to be considered a top player is how well they stack up against their divisional rivals. 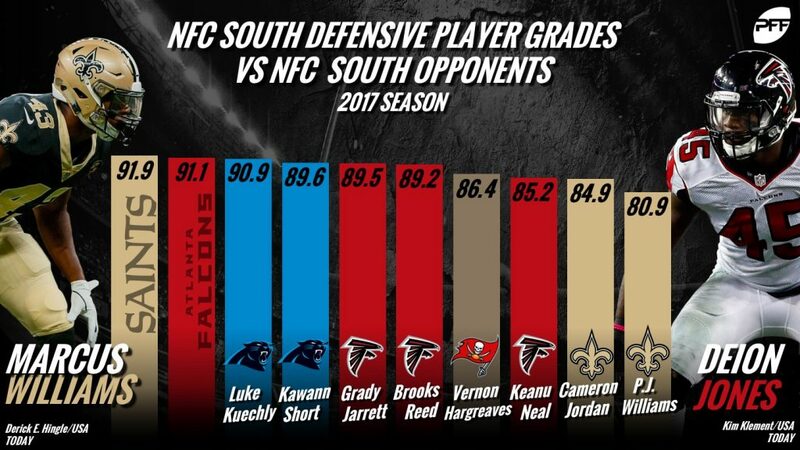 In our last look back at the 2017 season, we take a glimpse at the players who have the highest grades against their division rivals from a season ago. We’ll take a look at the top-10 grades on offense and defense only on contests against their respective divisions. How well did your favorite players play against the division last year? Don’t see them below? Grab a PFF Elite subscription for access to Premium Stats 2.0 to find out for yourself. Since the Saints drafted Michael Thomas with the 47th pick in the 2016 NFL Draft, he has been a force in NFC South clashes. On 174 snaps in route, he was caught 40-of-52 targets for 499 yards, generating a 125.4 passer rating. His three touchdowns against the NFC South were tied for first with teammate Ted Ginn Jr. The best news for the Saints? Thomas is only 25 years old and is just getting started. The wily veteran in the Falcon’s receiving corps, Julio Jones has plagued NFC South cornerbacks. He checked in slightly behind Thomas in 2017 with a 91.6 offensive grade against division foes but saw more targets with a total of 63, and more yards after the catch with 261. What’s more, Jones averaged a very healthy 3.78 yards per route run, which bettered the mark of Thomas (2.87) and paced all divisional pass-catchers. It feels like ages ago Jones was drafted, but he remains a staple of the Falcon’s offensive attack. No one was more electrifying to watch last year than Alvin Kamara, and he found himself almost neck-in-neck with Jones a season ago with a 90.9 offensive grade against the remainder of the division. As a staple of the Saints passing attack, Kamara averaged 3.32 yards per route run against his divisional rivals and generated a passer rating of 113.2. He also averaged 8.3 yards after the catch per reception and had an 83.0 percent completion rate when targeted as well. Matt Ryan, or “Matty Ice” as he is more affectionately known, has been the starter since Day 1 for the Falcons since being drafted in 2008. A season ago, Ryan dominated the division in-route to an 86.5 offensive grade and a 5-1 record to boot. Ryan notched a 75.9 percent adjusted completion percentage with his average depth of target at 9.2 yards, while he also led all NFC South signal-callers in passing yards with 1,668 and was second with nine ‘big-time throws.’ Ryan has become the ageless wonder and continues to show-out against his division rivals. The Falcons cemented Jake Matthews as the key to their offensive line for the next five years this past summer with a massive $75 million dollar deal. It comes as no surprise as Matthews finished his divisional matchups with an 81.3 pass-blocking grade and a 96.3 pass blocking efficiency mark, having allowed just 16 pressures on 230 pass-blocking snaps. Matthews allowed only one sack all year against divisional foes and was only beaten twice by a defender. Matthews is key not only in pass protection but in paving the way for two talented running backs as well. Mack was tied for third with 230 pass-blocking snaps played and allowed only nine total pressures. Marpet wasn’t beaten by his defender a single time in 120 pass-blocking snaps played. Brees led all quarterbacks with an 81.9 percent adjusted completion percentage and a 112.9 passer rating to boot. 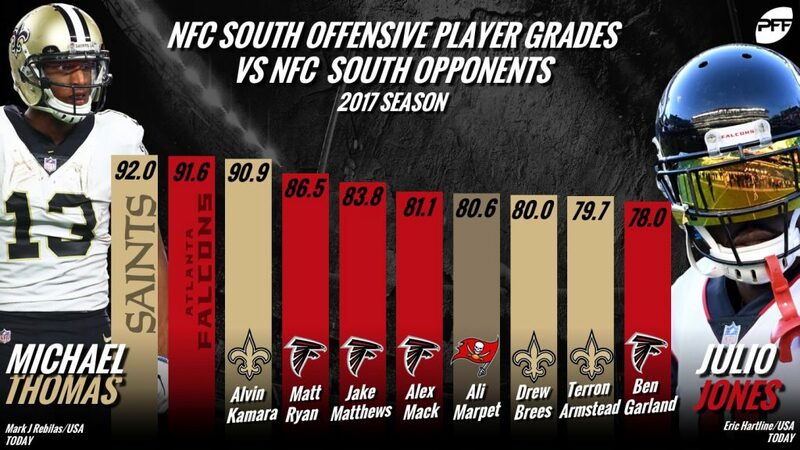 With an 86.1 pass-blocking grade, Armstead finished first among NFC South offensive tackles. Garland allowed only one sack in 156 snaps and registered a 94.9 pass blocking efficiency mark. Marcus Williams turned in one of the most dominant rookie seasons in recent memory and completely stuffed the NFC South division. Williams posted a 91.9 overall grade while playing 330 total snaps for the Saints. The telling stat on Williams was his coverage: In 200 coverage snaps played, Williams allowed one catch for nine yards with four interceptions which all led to a 91.0 coverage grade. Williams refuses to let one play in the NFC Championship define him and he is on a mission this year to prove the doubters wrong. Expect success from this young man. When an NFL fan thinks of the Carolina Panthers, they think of Luke Kuechly. He has been a force on the Panthers defense and earned a 90.9 overall grade, which ranked third in the NFC South. As always, Kuechly was a run-game stopper, totaling 30 stops against conference rivals for a 14.6 percent run-stop percentage. Additionally, he remained an every-down linebacker in 2017, playing 385 total snaps in the division, which was tied first with Ken Crawley of the Saints. As long as Kuechly stays healthy he is one of the most dominant off-ball linebackers in the NFL. Not many interior defenders were as dominant in their all-around game as Kawann Short. Short posted an 81.7 run-defense grade and a 79.9 pass-rush grade. He finished the season with a 9.1 percent run-stop percentage with nine total stops. In pass-rush, he had a 13.5 percent win-percentage and a 12.2 percent pressure rate (19 total pressures on 156 snaps), which was ranked fifth in the division among interior defensive linemen with at least 50 snaps. Short signed a massive contract extension last offseason and proved the Panthers right with his stellar all-around play last season. Checking in at number five on our list is Grady Jarrett. Jarrett is a smaller interior player in size at only 6’0”, but he plays bigger than that in the run-game: he posted a 91.8 run-defense grade against the NFC South. Additionally, he tallied 11 stops in the run-game which led to a 10.8 percent run-stop percentage against the division. He also led all interior defensive players in tackles for loss or no gain with six. Jarrett is currently working on a long-term deal with the Falcons and it’s easy to see why they want to keep him. 19.7 percent win-percentage on pass-rush snaps ranked fourth in the division and he created seven total pressures.7. Allowed a passer rating of 51.6 passer rating against and yielded only four receptions for 22 yards on 51 coverage snaps. Neal’s nine total stops in the run game were first among NFC South safeties and tenth-most in the division. Jordtotaledled 28 pressures, six sacks and batted one pass against the division. Ranked third in the NFC South and first on the Saints with a 90.8 run-defense grade.